Request precisely customized die cut sponge from an array of sponge materials for better products. Contact Frank Lowe for sponge die cutting services. Cushioning, sealing, gasketing, and absorbing are just a few of the many applications where Frank Lowe's die cut sponge is used. Our sponge material is regularly used as an environmental seal on weather stripping and door edging as well as for noise filtering, insulation, and dampening. We offer die cut sponge of different densities, thicknesses, and compositions to meet your unique needs. 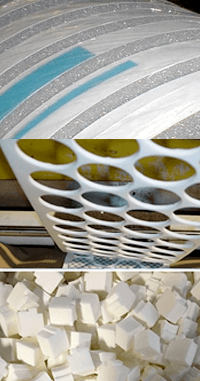 Regardless of the application, Frank Lowe can manufacture die cut sponge gaskets and other products in a vast array tolerances, appearances, materials, and finishes perfectly suited for your specific manufacturing needs. Most importantly, we will help you choose the best materials and specifications for your industry, business, and individual application. We use only quality materials. This allows our die cuts to exhibit the highest level of characteristics. Learn more about the characteristics and features of each type of sponge die cut materials. We offer both open and closed cell sponge rubber gaskets for applications. Open cell sponge rubber gaskets have interlocking cells, which work to seal out air and dust, but allow liquid and gas to permeate. Closed cell sponge construction features trapped gas bubbles of medium density. Our closed cell sponge gaskets are best for applications where liquid or gas should not permeate through. At Frank Lowe, we create die cut sponge products to meet your application needs and exceed your expectations. You can choose from a vast expanse of sponge materials offered in different durometers, colors, and thicknesses. Most importantly, we'll suggest the appropriate customizations to ensure your die cut sponge product meets the needs of your application. Why Choose Frank Lowe for Die Sponge Cutting Services? At Frank Lowe, we pride ourselves in nearly 70 years of experience creating die cut sponge products for an endless list of applications. By doing so, we've created several economies of scale and learned what works as well as what doesn't. We'll pass this knowledge onto you and help bolster your overall manufacturing process. Solutions to avoid bottlenecks on large orders. Quick turnaround times on all sizes of orders and fast delivery. Ability to produce both high and low volume orders. Full complement and range of quality elastomers. Exact die cut rubber products created to your specifications. When it comes to choosing the best die cut sponge material, there are no one-size-fits-all solutions. While one sponge material may work well in one product, it could fail or create a hazard in another product. Because of this, it's imperative to choose the right die cut sponge elastomer based on the application and your budget. Explore different types of material and innovative ways to create efficiencies. Pursue the cost feasibility of each material with an in depth analysis. Create the best possible die cut sponge for your product within budget. Whether you're just getting started or have been in business as long as we have, it's never too early or late to partner with the team at Frank Lowe. Let's talk. We're ready to listen. Contact Frank Lowe today for die cut sponge solutions. Not sure about the exact materials or specs required for your sponge product application? Let's chat. We'll help you find the right solution. Are You Using Sponge For Your Product Application? Let's talk. We'll help you choose the right sponge materials for your product.